When I was a young man, I took my girlfriend at the time to the Silver Spurs Rodeo in Kissimmee, Florida. Before Kissimmee became the home of Mickey Mouse’s empire, it was a cowtown. The Silver Spurs is the most prestigious rodeo in Florida. My father, my grandfather, and my Uncle Pete have all been the overall champion of the rodeo. When I went to the rodeo that day, my father had been dead for thirty years. A whole new generation of cowboys were roping calves, riding broncos and bulls, and wrestling steers. 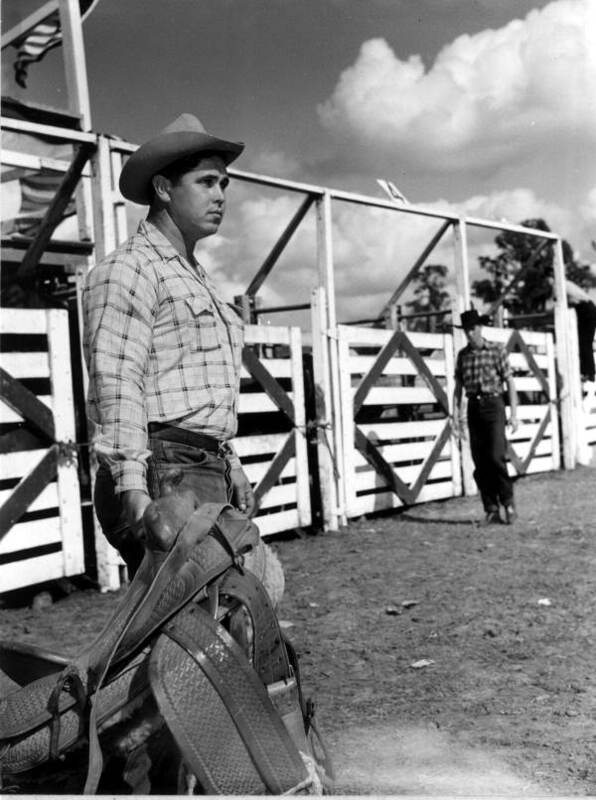 For me, however, being in the arena brought out a wistful longing: I wish I could have seen my father rodeo. My uncle Pete was probably the best in the family as an all-around cowboy, but from the stories I’ve heard over the years, Daddy was at his best in steer wrestling and bull-riding. Steer wrestling involves jumping from your galloping horse, grabbing a steer by the horns, and wrestling him to the ground. Daddy set the record time in Florida of throwing a steer in 1.8 seconds. The current world record is 2.4 seconds. Daddy was in a class by himself. Bull-riding means getting on the back of a bull in a tight chute, getting a firm grip and a far-away look, hollering to open the gate, and then staying on the back of the bull for eight seconds. Judges score you on the difficulty of the ride. If you think it sounds hard, you should try it (and no, bull-riding machines in country bars are no match for the real thing). Maybe it was Daddy’s size, but he had a knack for staying on and scoring high. My father died when I was eighteen months old, so I have no memories of him, just stories and pictures. In the stands at the Silver Spurs Rodeo, I admit I felt again the old emptiness, wishing just I had seen him just once throwing a steer or riding a bull. Bull-riding is usually the last event in a rodeo, because it is the most exciting and most dangerous of rodeo events. That day, three or four riders had come out of the chute and been thrown off in the first three seconds. It looked like no cowboy would make his ride. Keep in mind I am sitting with my girlfriend in the covered stands with about ten thousand people. An old Florida cracker cowboy was seated next me, his wife on the other side of him. I greeted him when I sat down, but he wasn’t much for conversation. I wish I remembered the man’s name. He told me about Daddy, about rodeoing with him, working cows with him, and having some high times together (he obviously didn’t want to go into details with his wife listening in). For that moment, the emptiness was filled. I received another small piece of my father, another few stories to add to my soul. That Florida cracker cowboy gave me a gift that day: he made me proud to be the son of the man I don’t remember. The Apostle Paul talks about Jesus redeeming us so God the Father can adopt as sons. To be adopted as the son or daughter of God means more than going to heaven; it means we can be proud of our Father in heaven, who gives us grace, who guides our lives, and who helps us live in confidence. It is not our reputation that matters; we hold the reputation of our Father in Heaven. Are you proud that you are a child of your Father in Heaven? Are you living in the confidence of being his son, his daughter? I remember walking out of the arena after the rodeo was over that day. I held myself a little taller. There was a touch more confidence in my stride. That day I remembered I was the son of Kong. His reputation rested on me. Every day, walk a little taller. Every day, put more confidence in your stride. If you follow Jesus, your Heavenly Father’s reputation rests on you.